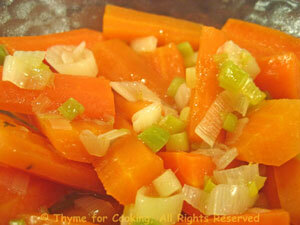 Carrots with Green Garlic, Thyme for Cooking vegetable side dish. A bit of green garlic adds spring flavor to this year-round staple. Peel carrots, cut in half, then each half again so you have carrot sticks. Trim and slice green garlic, using most of the green tops. Add green garlic and sauté briefly. Cook, covered, 15 minutes or until carrots are done. Remove cover, drain or cook off any remaining liquid and serve.